Wheat includes several species and a huge number of cultivars (more than 25,000) (van Ginkel et al., 1996). Wheat taxonomy is complex, not only because of the number of species involved (up to 20), but also due to conflicting classification approaches. The traditional approach focuses on habitat and morphology, while the more recent genetic approach gives more weight to interfertility. Both systems coexist and are commonly used. The following table shows the names of the main domesticated wheat species in both systems. - Feed: grain and by-products Triticum aestivum L. subsp. aestivum Triticum aestivum L.
- Feed: by-products Triticum turgidum L. subsp. durum (Desf.) Husn. Triticum durum Desf. Spelt - Specialty foods (health, etc.) Triticum aestivum L. subsp. spelta (L.) Thell. Triticum spelta L.
Einkorn - Relict crop for food (bulgur) Triticum monococcum L. subsp. monococcum Triticum monococcum L.
Wheat (Triticum spp.) is one of the most important staple food crops for humans: it provides about 20% of food energy and protein worldwide. It is the most widely grown crop in the world with 225 million ha harvested in 2009. Wheat grain production (682 million t in 2009) ranked third among cereals after maize and rice (FAO, 2011). Average biomass production of wheat is about 14 ton DM/ha (McKendry, 2002). Wheat grain is mainly processed into flour (whole grain or refined) for the production of a large variety of bakery products, pastries and confectionary. 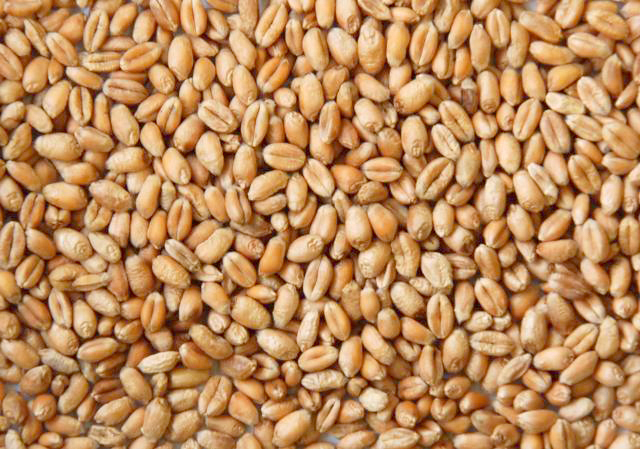 Durum wheat is a wheat species (Triticum durum) dedicated to semolina, couscous and pasta production. 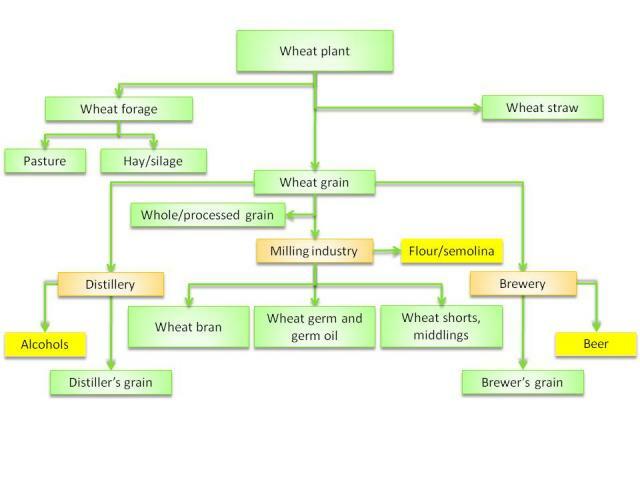 Wheat is also used in the distillery (including biofuel), brewery and starch industries. The wheat plant is a strongly tufted (from 2-5 to 40 tillers/plant) annual grass, 0.4-1.2 m tall. It is highly variable in size, inflorescence and grain morphology, depending on species, variety and cultivar, each adapted to specific growth conditions or utilization. The root system includes seminal roots and adventitious roots. Culms are glabrous, erect, cylindrical, with solid nodes and hollow internodes. Leaves are flat, 1-3 cm broad x 20-38 cm long. Leaf size increases with leaf insertion on the culm. The inflorescence is a long, slender, somewhat flattened spike. The spikelets are borne at each node of the disarticulating (wild species) or tough (cultivars) spike rachis. Spikelets are awned or awnless, with between 2 and 9 flowers. The seed is an ellipsoid caryopsis, ventrally grooved that can be reddish-brown, yellow or white coloured (Ecocrop, 2011; van Ginkel et al., 1996). Wheat grain: 10% of the world wheat grain production was used for feed in 2009 and wheat ranks third among cereals used for animal feeding (FAO, 2011). Wheat probably originated from the fertile crescent in the corridor extending from Armenia to the south-west coastal areas of the Caspian Sea in Iran. Current wheat species may have resulted from the hybridization in about 6000 BCE of the cold hardy diploid species Aegilops tauschii ssp. strangulata with the tetraploid Triticum turgidum (Emmer wheat). Wheat is the most widely grown cereal grain, from the Arctic Circle to the higher elevations near the Equator (up to more than 3000 m above sea level). However, it grows best between 30° and 60°N and from 27° to 40°S (Ecoport, 2011; Ecocrop, 2011). Wheat grows well when average temperatures are about 25°C and in areas where the annual rainfall ranges from 375 to 875 mm. It is, however, possible to grow wheat in places where rainfall ranges from 250 to 1750 mm, provided it is well-distributed. Wheat grows best with rather hot and dry summers (humidity below 10% is preferable) since humidity may promote fungal diseases. Wheat grows on all soil types with a broad range of soil pH (4.5-8.3), but prefers fertile dark soils rich in nitrogen. Soils should be well-drained. It can tolerate slightly saline soils (up to 4.5 dS/m electrical conductivity) (Ecocrop, 2011; Ecoport, 2011). Wheat can be grown in tropical and subtropical regions provided the area is not too hot and humid. It is then generally grown in elevated areas during the cool and dry season. In these areas irrigation is often necessary: 45% of developing countries wheat production comes from irrigated fields. Irrigation should be done so that no waterlogging occurs (Rossin, 2009). Wheat grown in intensive systems requires high levels of inputs, including herbicides, pesticides, mechanical power and fertilizers (N and K). These requirements may result in N leaching and water contamination with nitrates and residues (Clay, 2004). In some areas, wheat cultivation may result in soil erosion and soil salinization (when wheat is irrigated). Introducing wheat can occasionally require deforestation, resulting in biodiversity losses (Clay, 2004; Runge, 1994). 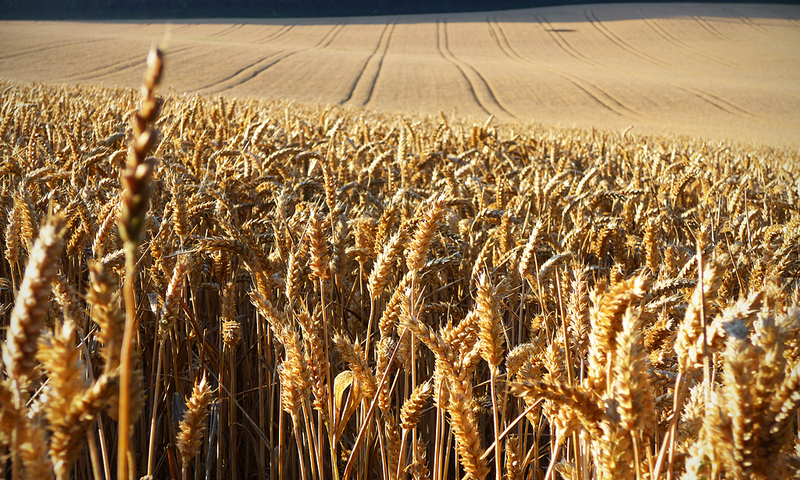 As of February 2013, no genetically modified wheat has been made commercially available. Research on GM wheat is being carried out in Europe and in the USA in order to develop wheat resistant to glyphosate and fungal diseases, and that has enhanced baking properties (GMO Compass, 2010). Wheat storage proteins (albumins, gliadins and glutenins) also act as chemical defences against pathogens and phytophagous animals. Gluten, a protein composite of gliadin and glutenin, is known to cause digestive disorders in gluten-sensitive humans. Other digestive diseases (including allergy) have been linked to gliadins. Wheat albumins are reported to have an anti-amylase, anti-tryptic and anti-lipase activity in some animal species (De Bry, 2001). 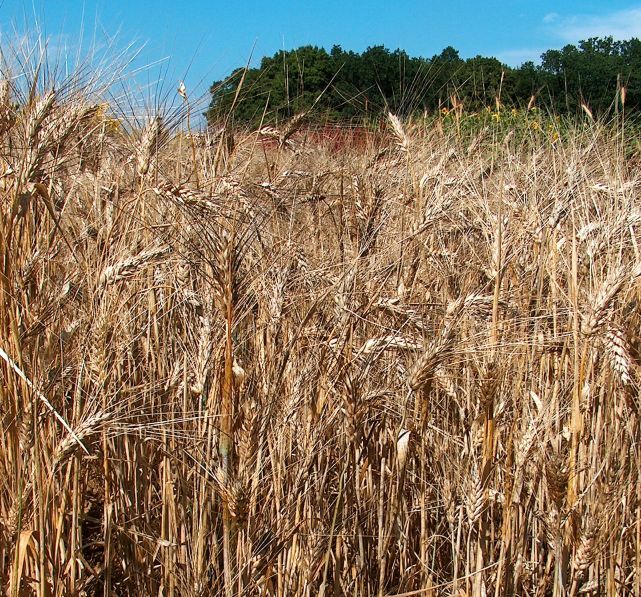 Gluten becomes viscous in the presence of water, and while this property is highly desirable for flour processing, it can be lethal to animals fed large amounts of wheat flour. Gluten was reported to cause dough balls in the stomachs of pigs, blocking digestion and starving the animals to death (De Bry, 2001). Pentosans (among which arabinoxylans) are polymers of pentose sugars that increase diet viscosity and cause antinutritional activity in poultry (Adeola et al., 2004; Choct et al., 1990). Wheat, like barley and other cereal grains, is susceptible to fungal diseases, notably by Fusarium species. 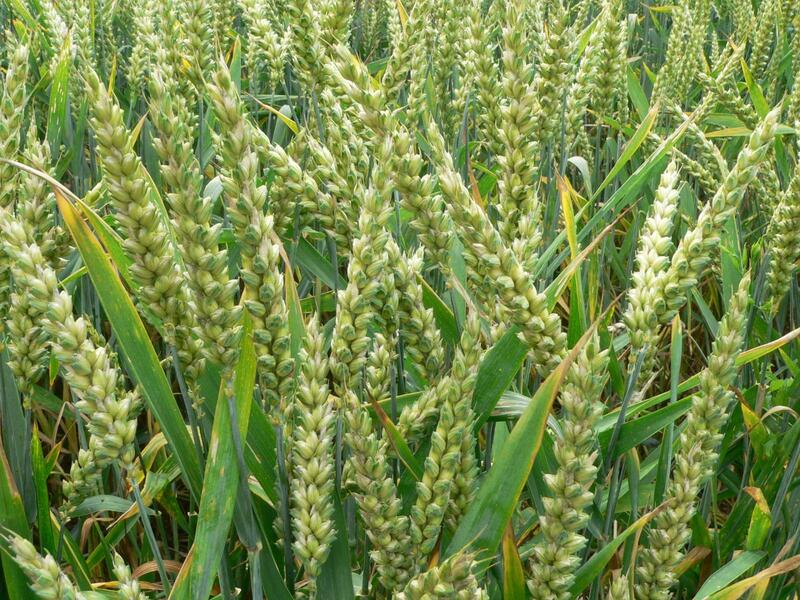 Fusarium infection occurs during flowering when the weather is warm and wet (fusarium head blight, also called scab), or during storage when the grain is not stored properly. Fusarium diseases are a major source of grain losses. In Argentina, several Fusarium epidemics of varying severity have occurred in the past 60 years in the Central-North wheat production area, where yield losses were estimated to average between 20 and 50% (Stenglein, 2009). In China, severe epidemics of fusarium head blight have affected more than 7 million ha of wheat and caused yield losses of more than 1 million t (Leonard et al., 2003). In Europe, EFSA has stated that the estimated exposures to the sum of T-2 and HT-2 trichothecenes based on the available occurrence data are considered unlikely to be a health concern for ruminants, rabbits and farmed fish. For pigs, poultry, dogs and horses the risk of adverse health effects is low (EFSA, 2011). Post-harvest fungal infections also cause mycotoxin contamination. In addition to Fusarium species, Aspergillus and Penicillium fungi benefit from elevated moisture and heating to develop during storage, resulting in production of ochratoxins and aflatoxins. It is important to store well-dried wheat grain (less than 14% moisture) at temperature below 20°C. Pests should be prevented from entering the storage area as they increase heat and moisture and favour fungal developments (TIS, 2013; Birck et al., 2006).